•	Is written specifically for college sophomores and juniors. 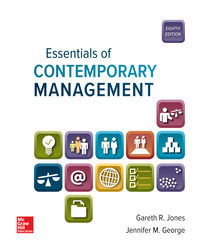 •	Provides the most up-to-date account of the changes taking place in business management. •	Focuses on challenges and opportunities facing businesses to bring management issues to life. •	Features Connect Management Application Exercises to help students demonstrate critical-thinking, decision-making, and problem-solving skills in real-world situations.